When creating circuits and wiring devices at home, you may need to create wire joints and splices. There are a variety of kinds of splices and joints in wire. A good wire splice or joint will be secure even before soldering. The soldering can act as an extra securing method and also prevents corrosion in the joint. Splices and joints in solid wire should also be covered with electrical tape for safety. When working with electricity, it's important to be extremely careful. 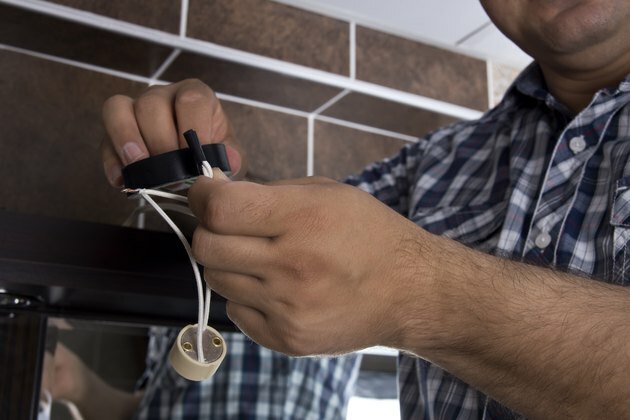 These wire splicing techniques are broadly the same for low voltage wiring of consumer electronics and the AC power supply to your home. When splicing wires, it's very important to bear in mind the risks, especially if you're working on something with high voltage. Make sure power is off, including the fuse, wear gloves, never work near water and always double check your work before turning the electricity back on. This is the most common type of wire splice. It's a straight splice between two small solid conductors. You'll need to remove above 5 inches of wire cover on each wire. Cross the exposed wires, first wrapping one side around the other six times, then repeating the process with the other wire. Cut off any excess with a wire cutter, then solder and cover with electrical tape. A rat tail splice, sometimes also called a pigtail, is another method of joining two conductors. It's more suitable for circuits where there's no physical tension. You'll need to strip the insulation from two ends of the two wires and then twist them together. They can then be soldered and covered with tape. A fixture splice can connect wires of differing sizes. It begins in a similar way to the rat tail joint. However, rather than the two wires being twisted together, the smaller wire, called the fixture wire, is wrapped around the bigger wire, called the branch wire. Once the full extent of the fixture wire is wrapped, the top of the branch wire should be bent over the top to hold it in place. Then, the joint should be soldered and taped up. A Y splice joint, also known as a tap splice, connects a conductor to a running wire. You'll need to remove about 1.5 inches of insulation from the running wire. Take the connecting wire and tie it in a knot onto the running wire to create a knotted tap splice. If you don't knot and just twist, this is a regular tap splice. Wrap the connecting wire around the running wire six more times. Again, cut off excess, solder and tape the splice.